Put the chocolate in a heatproof bowl, set over a pan of simmering water. Make sure the base of the bowl is not touching the water. Stir the chocolate until melted and smooth. Remove from the heat and whisk in the egg yolks, olive oil, warm water, and salt until well blended. In a clean bowl, beat the egg whites and cream of tartar with an electric mixer until frothy. Add the sugar and continue beating until soft peaks form. Fold 1/3 of the egg whites into the chocolate mixture. Combine gently until no white streaks are visible. Carefully fold in the remaining egg whites until well incorporated. 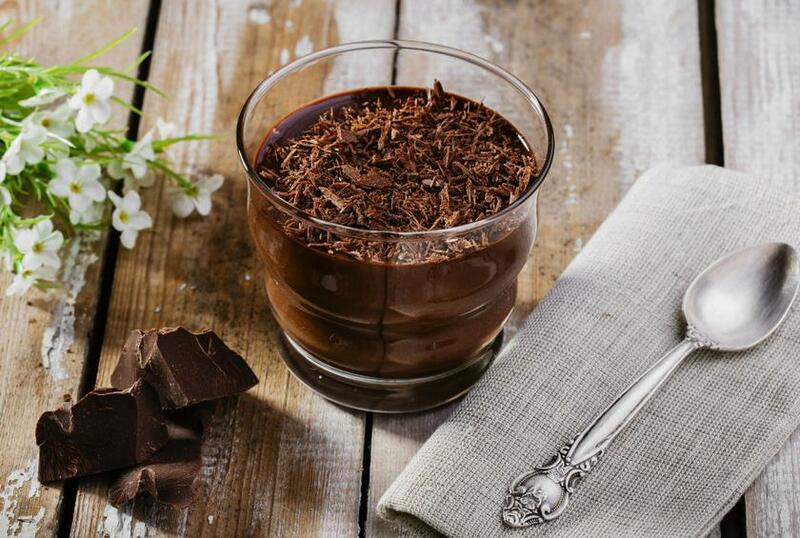 Divide the mousse equally between 4 ramekins or glasses. Refrigerate for at least 4 hours, until well chilled. Sprinkle with chocolate shavings before serving.